WELCOME TO SCOTTVILLE - Beautifully decorated Model A Townhome located in Powhatan's 55+ Active Community. 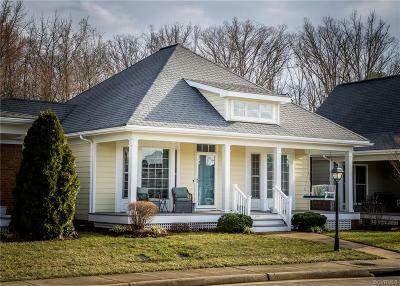 This home features beautiful hardwood floors in the living area overlooking the park area of Scottville. Master suite with bath along with an additional bedroom and hall bath offering plenty room for guest. An updated kitchen with a view of the wooded backyard along with an invisible fence front and back for the pets makes this an all around, maintenance free, perfect place to call home. Plenty of walking trails along with sidewalks that lead you to dinner, drinks or a workout at the YMCA! Directions: Rt. 60 West - T/L On Rt. 13 In Front Of Food Lion - Follow 2 Miles To Entrance Of Scottville On The Left In Round-About- Follow To Stop Sign T/L, House Is On The Left.